As one of America’s favorite writers of bone-chilling fiction, it surprising that Edgar Allan Poe only wrote one novel. 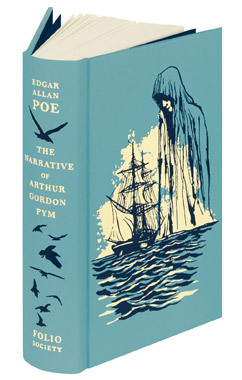 The Narrative of Arthur Gordon Pym was published first in few serialized installments in the Southern Literary Messenger, and the complete novel was published in July of 1838. In order to present an authentic sea-voyaging tale, Poe used a number of the plentiful travel journals that abounded at the time, and he also drew on his own personal experience. The story is narrated retrospectively by Arthur Gordon Pym whose school fellow, Augustus, enchants him with lore of the sea and, as his fathers is a whaling captain, convinces him sneak away from home and stow away aboard the whaling ship Grampus. The first half of the novel is the expected seafaring adventure, but it becomes increasingly unusual and bizarre. 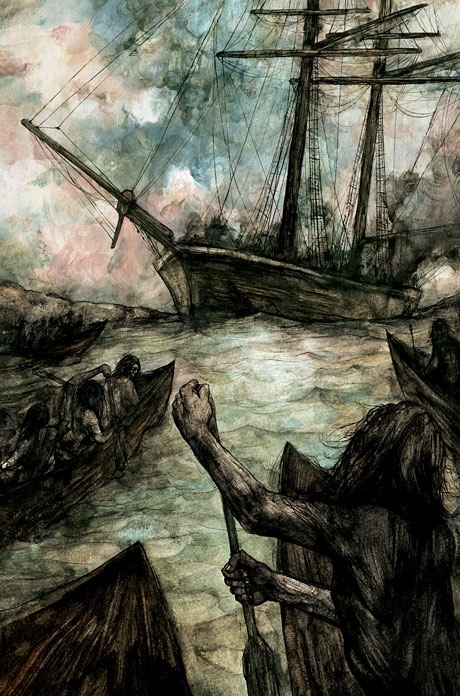 Mutiny, shipwreck, cannibalism and, of course, being buried alive all contribute thrilling elements to make up satisfying, old fashioned adventure. The novel ends very abruptly as Pym and a fellow sailor continue toward the South Pole, where it becomes evident that Poe thought the Hollow Earth theory at least in the realm of possibility. This hypothesis argues that the planet is either entirely hollow or that it possesses a substantial interior space. There was also conjecture that the areas surrounding the poles were very warm. I found the first half of the novel a delightful yarn in the same vein as Treasure Island, one which young boys especially would be sure to enjoy. While there are minor points along the way which Poe leaves unexplained, the most jarring part of the novel was its non-ending. The tale breaks off before it is concluded with a “note” stating, “The circumstances connected with the late sudden and distressing death of Mr. Pym are already well known to the public through the medium of the daily press. 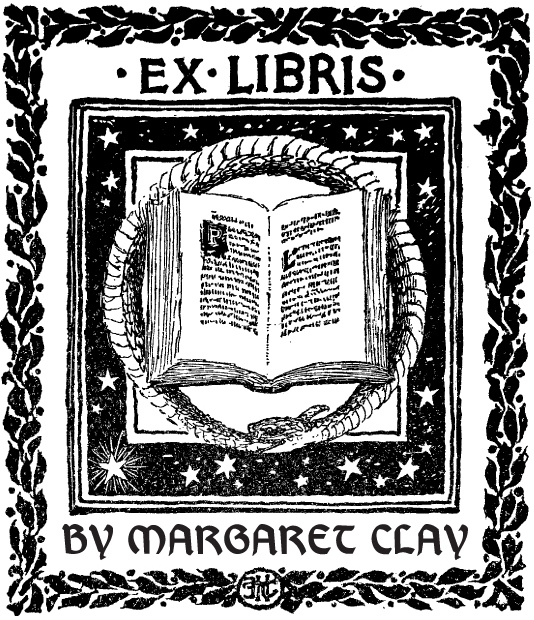 It is feared that the few remaining chapters which were to have completed his narrative, and which were retained by him, while the above were in type, for the purpose of revision, have been irrecoverably lost through the accident by which he perished himself.” Clearly, Poe was done. I enjoyed reading this Folio Society edition especially as it was bound in a rather petite, compact size of 7 x 4 inches. The illustrations by David Lupton made it especially engaging reading experience. 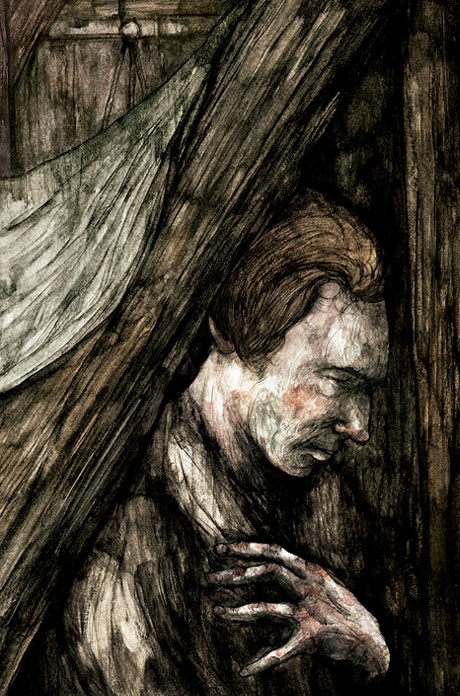 Illustration from The Folio Society edition of The Narrative of Arthur Gordon Pym © David Lupton 2015.